Eating is a story, not just a moment to fulfill a necessity. Every nation has special holiday dining customs and rituals. In the western world, we sit at a well decorated table and give our guests something stunning to look at while they gather to enjoy dinner. Your dining table should be colorful, inviting, extravagant (why not?) and especially filled with good food. It is easy to set up a table with traditional dishware, crystal glasses and silver flatware, nothing to it. The challenge comes when you want to do something out of the ordinary, colorful and follow your instinct instead of rules. How a table that responds to these characteristics would look like? First, create a color scheme, let’s say blue. It doesn’t mean everything on the table must be blue, you need to create a rhythm with complement or analog colors. Vincent Van Gogh said: “There is no blue without yellow and without orange”. Right there is the answer. With a blue tablecloth, yellow and orange tableware will be perfect. Blue is a cold color, yellow and orange are warm colors. You have created a color temperature. Start with choosing a theme for your table: Bohemian, bucolic, country and so on. Then select dark, medium and light values of the color you plan on using. Find some complement or analogue colors to mix in and to add rhythm to the table setting. Mix and match the tableware as you like. For this first tablescape the theme is Bohemian. I chose a white tablecloth as the base for layering all the colors. Two different colors tea tablecloth covered opposite corners of the table, one black with bird motifs and the other one in golden tones with classical motifs. Playing with geometry and mixing round with square plates from various dish sets is fun. Mix vintage and modern plates, mix colors and shapes, no rules and surprise yourself. I made the napkins from leftover material of various projects and closed them in brass napkin rings. Tea light holders made of rusted metal go well with brushed bronze flatware. Glassware don’t match on purpose, but the greenish tone is their common denominator to other items on the table. Prosecco bottle has an interesting Venetian embellishment. She is the autumn leaves lady that sometimes is on a wine bottle and sometimes is on a mirror somewhere else in the house. Her purpose is to embellish. For the second Bohemian table, I have used a floral tablecloth, made of silk fabric in silver tone, as the base, then I cover it half way with a red voiles shawl. Each set of glassware is made of three different styles glasses and each set is made of the same three pieces. 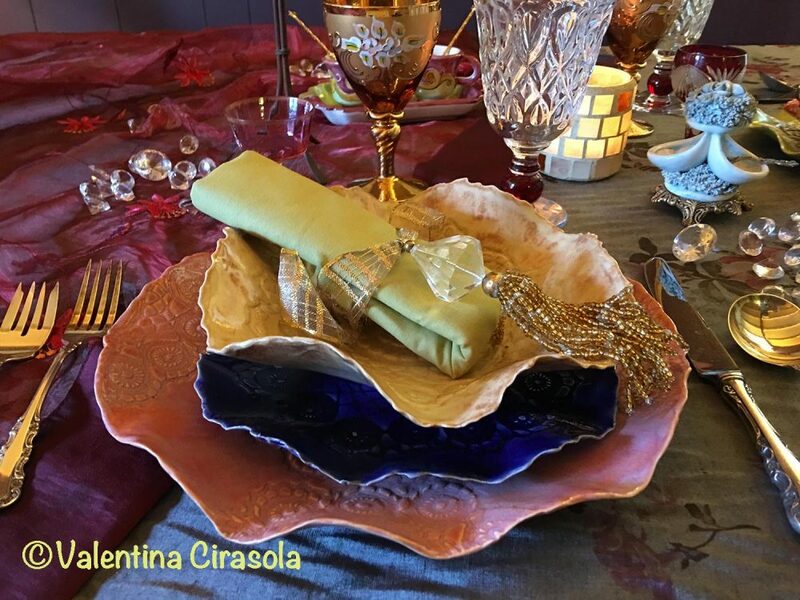 Even though, I chose a continuity in the glassware, I wanted my plate sets to be extravagant in style and colors. The silver flatware is a contrast to the gold wine glassware. 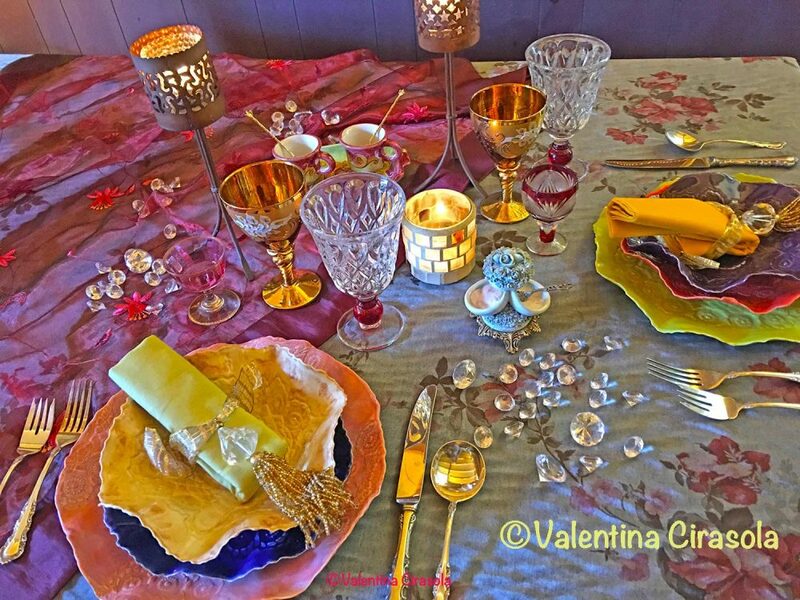 I scattered some acrylic diamonds on the cloth to pick up light from candles and lamps outside the table. The table is set for two, it would be just the same for 4-6 or more people. A dinner table is for food and conversation, decorations should be kept minimal and low to allow guests to see each other and talk across the table. 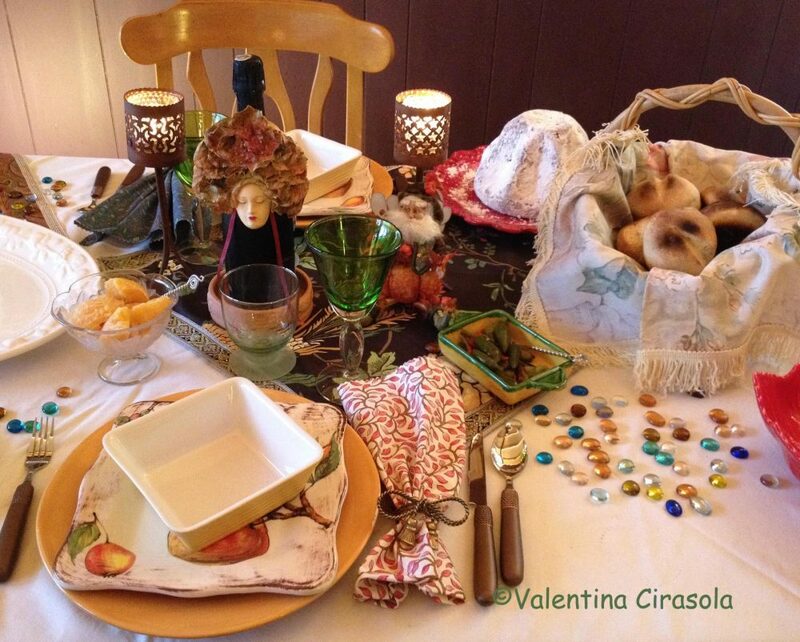 This will be the topic of my next TV Show: “Dinner At 7:00” produced under my label Valentina Design Universe. 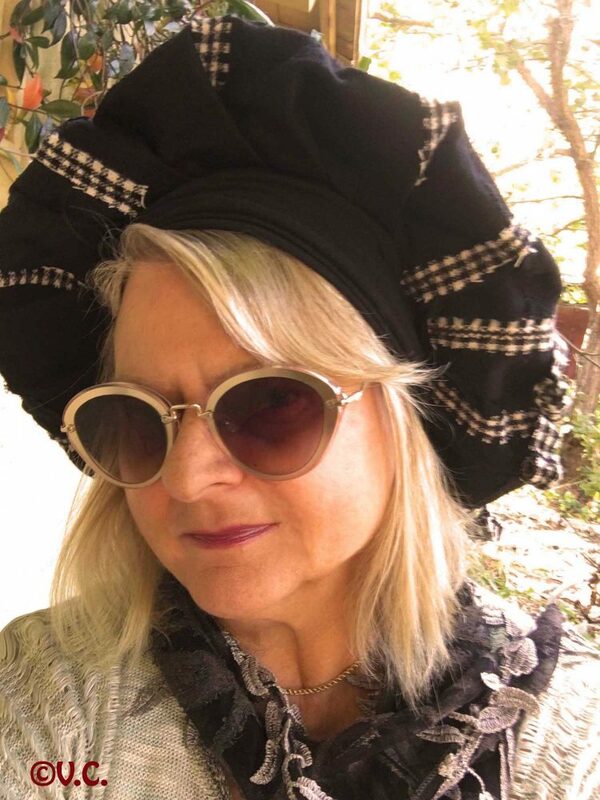 In my second book, Sins Of A Queen, I wrote that “Salt is the spice of food, attitude is the spice of life”, but in my designing business colors and fabrics are the spices of a home. We have entered a new decade of a young millennium with a new gentle attitude when approaching style. We are freer than ever to decorate or even to dress as it is most pleasurable to our eyes and without following made-up rules any more. Yet every 40-50 years we take inspirations from past time décor or fashion, turn it around and make it new again. That is because looking back in the past is nostalgic for those who have lived it and refreshing for those who have not yet. Who would have imagined that the hippies ‘70s era would have brought inspiration to copy today!? Well, not really copy it, but remake it into a new sophistication. Today looking at the ’70s means to take the psychedelic patterns, the bold colors, the vivid floral fabrics of that era and mix them with the contemporary style or even with traditional furniture. The objective is to incorporate without falling into the matchy-matchy syndrome. I say, feel free to mix paisley with geometric lines, fringes with appliquéd designs or rich velvet, quilted pieces with leather pieces, masculine with feminine, but do it with a conscious style and taste. The Bohemian style of this decade has a well researched look, sophisticated, soft, gentle and vintage versus the jumble of colors and patterns of the ‘70s that went hand in hand with scruffy, casual and untidy fashion look. 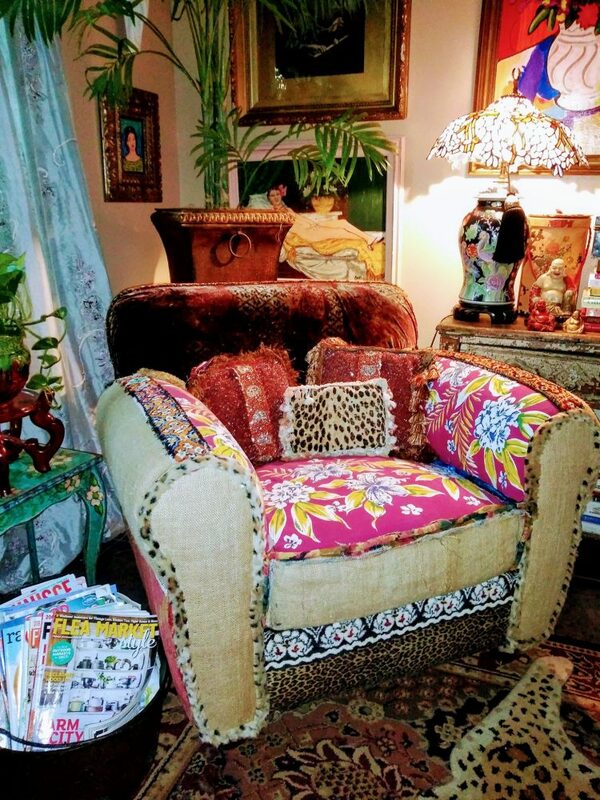 The Bohemian style is totally different from Shabby Chic style, you might find vintage items and vintage colors and fabrics, but you will not find distressed and worn out items, only suggestions to the past. 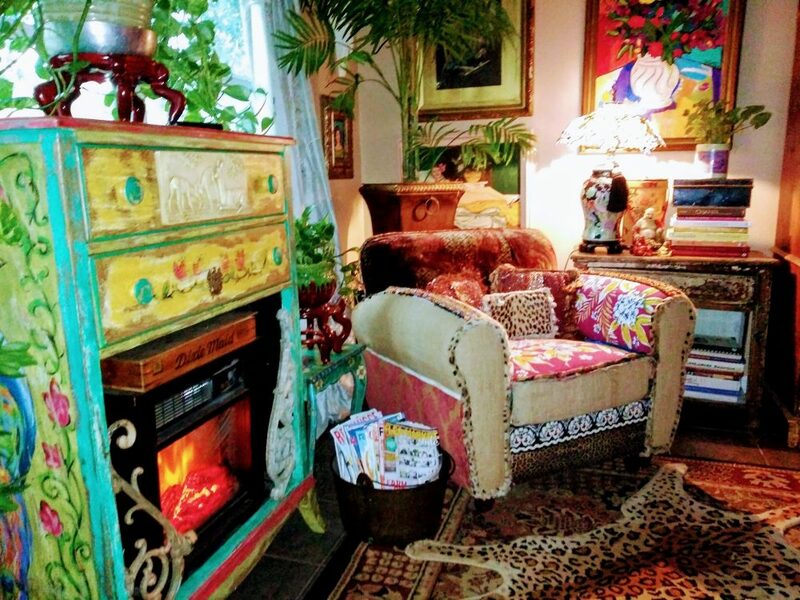 Furniture of the Bohemian style are well-preserved even if they are from the ’70s, no chipping in the wood and in the varnishes, leucite, bakelite materials and flowers in every colors and shapes for accessories. In homes a striking Bohemian color palette allows the browns, grey/silver and Prussian blues to live together in a combination of velvets, tapestries and 16th century French prints. Opposite to this autumnal colors, the new Bohemian style allows to decorate interiors in a more young dynamic way with pinks, oranges and dark blues or purples in an attempt to revive the hippies fashion’s vibrancy and rebellious colors. In a bedroom, bring a patchwork floral quilt with mixed floral prints pillows and set it against a heavy textured wall for a new chic. We will see beautiful and interesting stones on the walls again, such as bricks. I absolutely adore any natural stones! 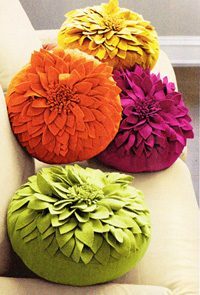 In the living room, add a bundle of colorful flowers pillows to that beige tired sofa and watch life come back to the room! 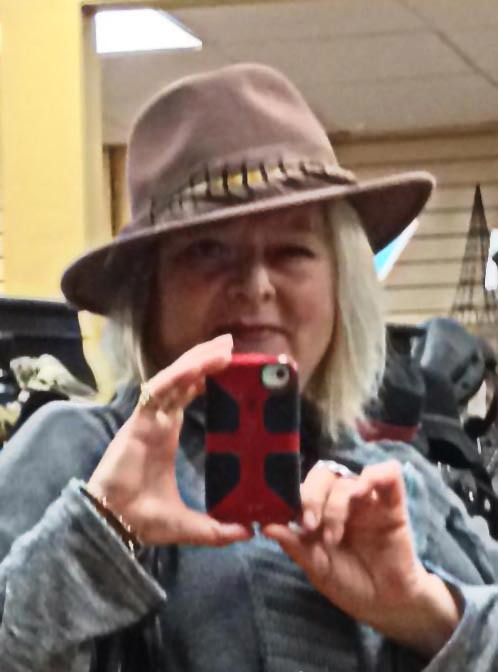 Valentina Cirasola has been in business as a designer since 1990. She has helped a variegated group of fun people realizing their dreams with homes, offices, interiors and exteriors. She is a designer well-known to bring originality to people’s homes. As an Italian designer and true to her origins, she provides only the best workmanship and design solutions.